Crisp fall days are perfect for planting garlic, onions and shallots. Fall planting gives them a big jump-start. The rule of thumb is to plant the sets (individual bulbs) after the fall equinox. They’ll thrive in a sunny location with well-drained soil, rich in organic matter. Apply Espoma’s Bio-tone Starter Plus, an organic fertilizer that contains beneficial bacteria and mycorrhizae to encourage strong root development. Your plants will put on roots in the fall but little or no top growth to survive the winter. Mulch the beds with a 4-6” layer of seedless straw, or leaves for winter protection and weed control. Plant additional bulbs in the spring for a double harvest. Garlic grows best in full sun with loose, fertile soil that is moist but well-drained. Mix Espoma Organic Potting Soil into the planting bed to promote soil health. Plant your garlic cloves root side down, about 2” deep and 4-6” apart. Space the rows about 12” apart. Apply Espoma’s Bio-tone Starter Plus and water deeply before applying a thick layer of mulch. Young garlic shoots will appear in early spring and be ready for harvest by mid-summer. Garlic comes in all shapes and sizes. Their flower stems can also be picked and used in cooking. Onions prefer the same sort of soil as garlic, loose and fertile. It’s easiest to dig a trench 2-4” deep and set bulbs pointy side up, every 6” or so. 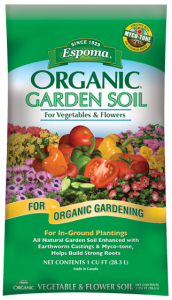 Apply Espoma’s Organic Garden-tone to promote rooting and over all good health for the plants and soil. Water well if there is no rain in the forecast and apply a thick layer of mulch. Mulch will help keep the weeds down and the moisture in. The shoots will pop up in early spring. They are remarkably tolerant of frost. Plant shallots in full sun in loose, rich soil that is moist but well-drained. Plant the bulbs 1-2” deep and spaced about 6-8” apart. Like garlic, each shallot bulb will yield a cluster of new bulbs. Use Espoma’s Bio-tone Starter Plus, an organic fertilizer to feed the soil and the bulbs. Shallots are shallow rooted. Mulching will help maintain an evenly moist soil.